We live in an area where there are many older homes with basements or newer homes that have renamed these spaces as man/woman caves. Basement leaks are common for many house owners and renters. Due to poor drainage and lot grading, over-full gutters or melting snow basements can flood easily. The flowing steps will help prevent water leaking into your basement. Close all cracks and gaps in the structure around windows. For the outside use epoxy sealer and for the inside masonry sealer is recommended. To further prevent water from leaking into the basement paint all repaired areas with waterproof paint. If the basement flooding is followed by heavy rains ensure al gutters and downspouts are clear. Ensure the draining is going into the optimal directions and at least 6.5 feet away from the basement. This will help prevent leaks and flooding. You can improve the amount of water absorbed outside before it makes its way into the basement. Planting water thirsty plants, shrubs, and flowers, as well as porous paves and different concrete option increase the water absorption and prevent water buildup. Avoid having large trees close to the house, as the strong roots can penetrate and break the basement structure allowing water to enter more easily. 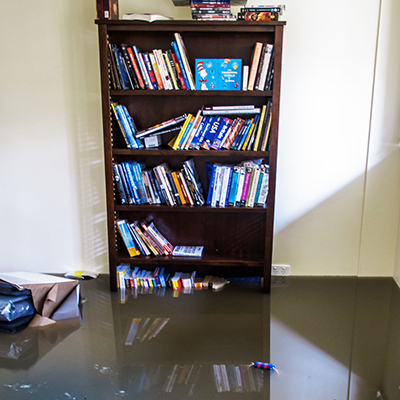 Install a sump pump at the lowest part of your basement and prevent major basement flooding. To ensure it is working properly regularly check and clean the pump. Fat, oil and grease, as well as other objects, do not belong in in pipes and should not be flushed down the toilette. These objects can cause drain blockages in the house´s plumbing system, which results in water backups in the basement. During the winter prevent basement leaks by shoveling the snow away from the house, where it is best suited for drainage. Melting snow close to the house is among the biggest threats to basement water damages and destruction.